Holwell Sports are set to meet Melton Town in the league for the first time next season after a shake-up of the non-league ladder. 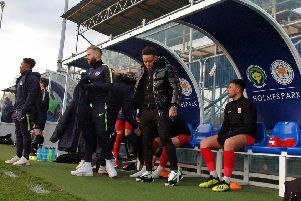 The mouthwatering derbies were a by-product of an FA review and restructure of the step five and six leagues, with Holwell moving out of the East Midlands Counties League to join Town in United Counties League Division One. The provisional lists were unveiled by the FA’s League Committee late last week, and sees fellow Leicestershire sides Aylestone Park, Anstey Nomads and Birstall United also make the sideways move into the UCL. Clubs have been given seven days to appeal against unwanted moves, but Holwell are not expected to do so. They became founder members of the new East Midlands Counties League when it formed 10 years ago, earning them promotion to Step Six out of the Leicestershire Senior League. Friday’s announcement received a mixed reaction at Welby Road, with some looking forward to a fresh challenge, but others frustrated at potential logistical problems. “It came as a bit of a shock,” said Sports chairman Graham Lewin. “I thought as we’d been in East Midlands Counties from the beginning we would be staying there. “We went to an East Midlands League meeting a while ago where an FA chap came from London to talk to us, but he didn’t know what was going to happen. So everything has been rumours. The shift means no matches against Nottinghamshire and Derbyshire sides, and a reunion with Leicestershire side St Andrews who were relegated from UCL Premier last season, as well as both Lutterworth sides. Holwell would also have four fewer fixtures in a smaller division, but would face eight trips into Northamptonshire, one to Cambridgeshire to play Huntingdon, as well as Lincolnshire sides Stamford, Grantham and Bourne. “We are concerned about the extra mileage and cost of fuel for the lads, but we haven’t sat down and worked it all out yet,” Lewin added. “We’re going to get on with it and look forward to the new challenges ahead. We have set targets which are optimistic, but achievable. “We might possibly have to do a bit more travelling to these grounds in Northamptonshire, but on the other hand the two Melton games should bring in good crowds and revenue for both clubs, so that’s a big plus. United Counties League chairman John Weeks said: “The big winners are the Leicestershire-based clubs who will join their recently-included neighbours, giving lots of local derbies which should be lucrative, but with minimal times and costs.